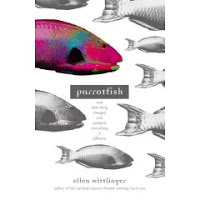 Parrotfish by Ellen Wittlinger. Advance reviewer copy from author. Publication date: July 2007. The Plot: Angela remembers being age six and the swim teacher saying, "boys in one line, girls in another." Angela was puzzled: "why did everybody think I was a girl?" Ten years later, Angela realizes that "inside the body of this strange, never-quite-right girl was hiding the soul of a typical, average, ordinary boy." Angela picks a new name: Grady. And with short hair, bound breasts, and a boy's wardrobe, Grady quietly yet proudly comes out as transgendered and starts living life as a boy, both at home and at school. The Good: Do you know how hard it was to write that plot description without using "her" or "him"? Wittlinger avoids those difficulties by having Grady tell his own story, in first person. Reviewing a book so far ahead of its publication date is tricky. As with Beige, I'll hold off being too spoilery. I began the book thinking Angela/Angie/she, as that is what the main character is called. But then Angela announces choosing Grady for a name; I quickly began thinking "Grady" (Angie's family had used Angie for sixteen years, I had only used it for a few pages) but found myself thinking she, she, she until about page 200 when I started thinking he, he, he without even realizing it. About that same time, I stopped picturing a girl dressed as a boy and started picturing a boy. As a reader, my journey was mirroring the journey of the people in the book. This is not a message book about being transgendered; this is a coming of age book about Grady, who happens to be transgendered. Grady learns what is needed to be a real friend, sibling, child; and to be all those things, he has to learn how to be himself. That's a common teen journey. And that alone is reason enough for this to make my Best Books Of 2007. Grady is strong; but he doesn't realize how strong he is. To start dressing as a boy, changing one's name in the middle of the school year, and honestly telling everyone requires strength; a weaker person would have continued to be quiet, on the sidelines, and waited for a new school year. Grady is now in high school; but he, along with his sister Laura and brother Charlie and best friend Eve, was homeschooled. Homeschooling is not portrayed as a negative; Grady and Laura are now in high school because a, their mother decided they had gotten beyond what she could teach, b, socialization. As for socialization -- the kids went to soccer, swimming lessons, and the like; Grady specifically says that "socialization" really means that "they hoped that being around boys would make me act like more of a girl." So this is NOT saying homeschooled kids aren't well socialized! It's saying these parents, suspecting something was up with their child, yet not being sure what, thought that going to school would change Angela. I also have to point out the humor in this book. Think transgendered teen, and you think angst and depression. Not so! Wittlinger not only doesn't make this a "if you are transgendered it's all sad" book, she also adds humor that had me laughing out loud (and thinking this would make a great movie.) For example, Grady lives in "that house." You know, that house -- the house in the neighborhood that is so over-decorated for Christmas that you wonder about their electric bill and how people find the time to put together something so extravagant. Grady's father has everything from reindeer to a nativity scene to bears; the family actually dresses up in Victorian clothes. This, despite the fact that Mom is Jewish. I want to repeat this book is as far from a didactic message book as one can get. Which, to me, would mean a fiction book that is really a non-fiction book dressed up with a story, resulting in thin plot and thinner characters. Here, at all times the story -- Grady's story -- is what drives the book, as it should be with any good book. The book's title comes from the parrotfish, an animal that can change its own gender. Beyond that, this book stays away from religion, politics and other arguments about transgendered people, concentrating instead on the story of one boy's struggles. Certain issues are dealt with: changing for gym, bathrooms, breasts. They are things someone would wonder about, so they have to be addressed, but it's done briefly and matter of factly. I also want to say that there is so much more I want to talk about; but it'll wait until a few months after publication. What else can I safely say now? Wittlinger surrounds Grady with a mix of supportive and non-supportive people; but at all times the supporting characters are well rounded. None are one-dimensional; none are used solely to spout things in either opposition to or in support of Grady. Well, I didn't read much more than the introduction to your review of Parrotfish, not wanting to spoiled in the slightest. This is a book I'll keep my eyes out for. There's a serious shortage of transgendered fiction. Wow. I can't wait to see this one. I was glad to see you write this: "I want to repeat this book is as far from a didactic message book as one can get. Which, to me, would mean a fiction book that is really a non-fiction book dressed up with a story, resulting in thin plot and thinner characters. Here, at all times the story -- Grady's story -- is what drives the book, as it should be with any good book." I'm excited to see books about characters with "alternative" lifestyle portrayed as characters not as dressed up messages.